Fresh new footage from the final season of Game of Thrones aired from HBO a few hours earlier. And the records of review are already taking a toll. 'Winter is almost here people!' The second footage from the final season of Game of Thrones aired tonight, just two months before the series's upcoming premiere in April. Almost a week after airing yet another short footage of "Game of Thrones" season 8, HBO this time released a rather longer teaser clip from the most awaited, final season of the series. Initially, the third video that HBO lined up just a few hours ago, already fueled the ever-growing fatigue that GOT's fan are enduring amidst its hiatus. The video with the title The Crypts of Winterfell initially begins with Jon Snow marching towards the burial place of Winterfell. Furthermore, Sansa is also seen walking towards John's path. And finally, the youngest stark, Arya is also seen in the crypts ultimately meeting her presumed half brother, Jon. The trio eventually is seen meeting at a point where they each faces three statues. But the suspense gets added when it is revealed that the statues they are facing are rather their own. Simultaneously, an icy threat is shown heading their way for which Starks show that they are prepared to face it down or die trying. You can also check the teaser's breakdown, easter eggs and many more on the video below! The very first footage from the GOT's season 8 screened at the Golden Globe Awards last January. A short commercial break aired during the gala which gave a brief outlook on the HBO's upcoming shows including Game of Thrones. At the same time, the golden globe also teased the promo including the small glimpses from the second season of Big Little Lies, the final season of Veep, the long-awaited third season of True Detective, and the second season of Barry. And while these are all phenomenal shows on there own, it’s still tough to steal the spotlight away from the HBO's fantasy epic. 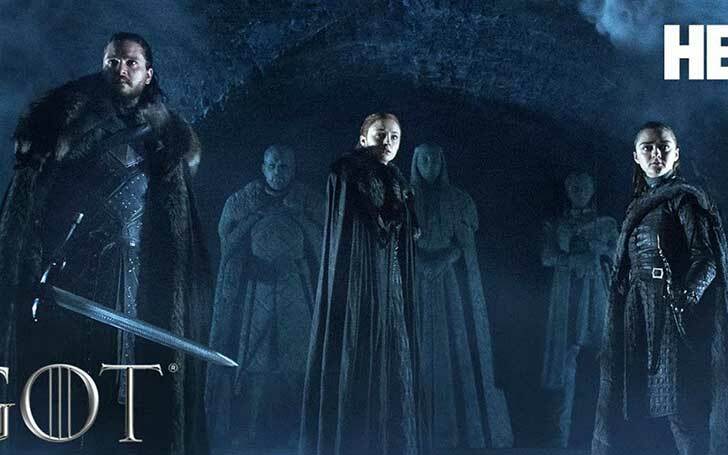 Though rather longer than the previous two footages, the almost 2-minute long footage has assured the fans that Jon is indeed reunited with his sisters and also prepared for the long-awaited threat from the so-called, the Knight King and its armies. Well, whatever the plot D.B. Weiss and David Weinoff adapted this time from The Song Of Ice And Fire, we can be sure that there is going to be a grand battle. But as to who will end up sitting on the much talked about Iron Throne, we have no other way of finding out but to just tune into HBO from 14th of April onwards. Fans have been waiting since August 2017 for the return of this epic show. So far, we only know that it will premier on April 14th in this year and that the series will comprise of 6 episodes in total. As for now, GOT fans are already on the edge of their seat with this recent teaser video. And as a fan, we have already had our share of killings through this dark fantasy series adaptation from the legendary writer, George R.R Martin. But, just so you know, the bloodshed, betrayals, and all that goriness are yet to hit us again. So, you better have that appointment with your psychiatrist, GOT goers!